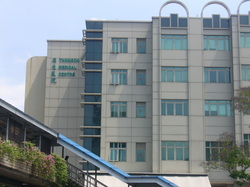 Thomson Medical Centre was set up by Dr Cheng Wei Chen, a gynaecologist, in the year 1979. It was the first hospital in Singapore to introduce the home-like concept and personalised care for each of its patients. Although the hospital is a relatively new one as compared to Tan Tock Seng Hospital which has a richer history, Thomson Medical Centre indeed has its moments. 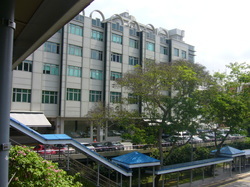 Located along Thomson Road near Novena Mass Rapid Transit (MRT) Station, Thomson Medical Centre is a private hospital which can accommodate a total of 190 patients. It specialises in gynaecology as well as IVF. The hospital is the answer to couples who have difficulties conceiving. It has been both nationally and regionally recognised in the history of medicine, especially after the birth of Asia’s first surviving IVF quadruplets. An interesting thing to note is that Thomson Medical Centre conducts Hospital Tours, to allow mothers to have a look around the hospital before being hospitalised for delivery. Specialised services provided are mostly on fertility and paediatric services, but there are also Chinese medicinal services in Thomson Medical Centre. Other hospital services comprise a 24-hour family clinic, a specialist outpatient clinic and a breast clinic amongst all others. It can be said that Thomson Medical Centre really cares for its patients, not neglecting the interests of foreigners as well. This is because it provides airport and transport services, accommodation services as well as visa arrangements and even extension. In 1982, it was the first private hospital in Singapore to have an obstetric ultrasound department to introduce the obstetric ultrasound scanning. In addition, it is the first private hospital to set up an in vitro fertilisation (IVF) clinic within its compound. In 1988, the hospital delivered Singapore’s first IVF triplets. The next year, it delivered Asia’s first surviving IVF quadruplets, delivered by none other than Dr Cheng himself. In 1989, a private cytogenetic laboratory was set up in Thomson Medical Centre’s premises. In 1990, Thomson’s first frozen embryo baby was born. In December 1995, the hospital delivered its first baby by intracytoplasmic sperm injection. Thomson delivered babies through assisted hatching treatment in 1999 and Blastocyst cultured frozen embryos in 2000. It became one of the world’s first fertility clinics to produce twins from frozen ova and frozen sperms. In the late 1990s, the hospital’s premises were expanded. There was a basement carpark, an extension block, a bigger lobby, shops and a café. In 2001, Thomson Medical Centre started Thomson Lifestyle Centre which provided full-body checkups and other medical facilities. The hospital was also listed on the Singapore Exchange secondary board listing SESDAQ in 2005. In 2010, however, Thomson was charged with an IVF mix-up which caused a baby to be produced with a different father’s sperm. However, the involved parents have decided to keep the baby.